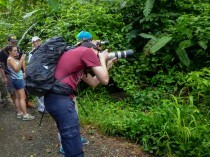 When I was planning my trip to Costa Rica earlier this year I searched the web for days to find a suitable backpack for my photo equipment. I already owned two Tamrac backpacks at that time: The large 5588 Expedition 8x and the smaller 3385 Aero Speed Pack 85. The 5588 is fine my for macro tours where I want to bring all of my equipment including a huge tripod, but it is way too large for a holiday trip and offers not compartments to store food, rain covers or spare cloths. The 3385 is fine for lightweight travelling if you want to bring your body with one or two lenses and some extra room for other stuff. I used this on my trip to Yellowstone National Park, where I brought my Canon EOS 7D together with a EF 16-35mm/2.8, EF 24-60mm/2.8 and a EF 70-200mm/4.0 and no tripod. 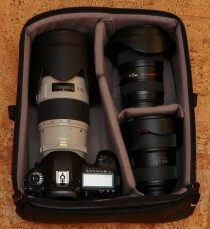 Finally I found two bags from f-stop which could full fill the job: The smaller Guru and the larger Loka. 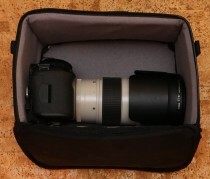 As all of the backpacks from f-stop they do not have a fixed photo compartment. Instead you can install a internal camera unit (ICU) which fits to your needs. As I was unsure which sizes would fit my needs best I ordered the Guru plus rain cover together with the Shallow Medium ICU and the Pro Small ICU. I tested the Guru together with the small medium ICU on my week trip to the Lindau Nobel Laureate Meeting where I took my EOS 5D Mark III together with the EF 70-200mm/2.8 L II IS USM, the EF 24-70mm/2.8 L USM and the EF 8-15mm/4.0L Fisheye USM and was amazed! It was no problem to additionally store my MacBook Air in the Notebook compartment and having enough room left for a jacket or something to drink. Through the week I noticed that the additional storage room might be a little to small for my Costa Rica trip and so ordered the Loka plus rain cover together with a Pro Large ICU to see what I could pack at maximum. The Shallow Medium ICU became my favorite choice. It is perfect to a full-frame body with a fast tele lens and two smaller lenses. The image shows the ICU filled with the EOS 5D Mark III attached to the EF 70-200mm/2.8 L II IS USM. 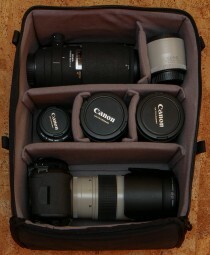 In the upper right is the EF 16-35mm/2.8 L II USM and in the lower right the EF 24-70mm/2.8 L II USM. Notice that a 1D body won't fit because of the height. The Pro Small ICU is OK if you want to bring only one long or two small lenses. The image shows the ICU filled with the EOS 5D Mark III attached to the EF 70-200mm/2.8 L II IS USM. Note that the camera is put upright in the ICU. The Pro ICUs are height enough to put in 1D bodies or the smaller ones upright! The Pro Large ICU is my work horse. If I have to bring a lot of stuff this is the ICU I pack! The image shows the ICU filled with the EOS 5D Mark III in upright position attached to the EF 70-200mm/2.8 L II IS USM. In the middle row on the left is the EF 50mm/1.4 USM (usually I pack the TS-E 24mm/3.5 L II there, but this was used to take the picture). In the center is EF 24-70mm/2.8 L II USM and on the right the EF 16-35mm/2.8 L II USM. On top left is the Sigma AF 180mm f/3.5 EX HSM APO macro and on the right the EF 2x III and some macro rings (which can be replaced by the EF 50mm/1.4 USM). Finally I took the Loka with the Small Medium ICU to Costa Rica filled with the EOS 5D Mark III, the EF 70-200mm/2.8 L IS USM and the EF 2x III converter and some macro rings. As there was some room left in the ICU I could put my polarizers there. If I needed a tripod I just attached it on the side of the Loka. The rain cover fitted perfect and provided enough shelter from the rain in the forests and after the rain it was very handy to hang my rain coat on one of the straps. So until now I am very happy with my two backpacks and I'm wondering why they're not so common here in Germany. PS: The unused ICUs are a perfect storage solution for the rest of the gear. There are also some shoulder straps you can order to easily carry them around. Sadly they were out of stock when I ordered so I couldn't test them. PPS: The BACK-PACK-STRAP from sun-sniper works perfectly together with both backpacks as they have enough possibilities to attach them. This entry was posted in Photography and tagged f-stop by twam. Bookmark the permalink.